His Grace Bishop Angaelos, General Bishop of the Coptic Orthodox Church in the United Kingdom, spoke at a Press Conference regarding a potential U. S. Genocide declaration in response to actions of the Caliphate against the Yazidi and Christian communities in the Middle East. The event was held at The National Press Club in Washington DC on 10 March 2016, and co-sponsored by The Knights of Columbus and Indefense of Christians (IDC). “If we look at Article 2 of the Convention on the Prevention and Punishment of the Crime of Genocide (1948) we find that these acts against Christians in the Middle East fall very much in line with the requirements laid out by the United Nations. “If Christians are excluded from the classification of Genocide, my concern, fear and expectation is that we will be responsible for a greater and more ruthless campaign of persecution against them, not only in Iraq and Syria but throughout the region. “What is happening in the Middle East and Syria is criminal and is an indictment of our humanity if left unaddressed. Whether speaking of Yazidis, Christians or other communities, the atrocities they face are deplorable and warrant not only our concern but our intentional action. “The path to Genocide is not laid overnight. It is a result of a gradual accumulation over decades, involving ongoing persecution and marginalisation of vulnerable communities. Having gone unchecked on our watch, this has led to our desensitisation and the acceptance of this discriminatory dynamic as the status quo. Alongside His Grace, panellists included, Supreme Knight Carl Anderson, Chief Executive Officer and Chairman of the Board of the Knights of Columbus, Nina Shea, Director of the Centre for Religious Freedom at the Hudson Institute, Johnnie Moore, President of The Kairos Company, Professor Gregory Stanton, Founding President, Genocide Watch, Juliana Taimoorazy, Founder, Iraqi Christian Relief Council, Father Joola, Chaldean Catholic Church in Erbil, Father Douglas al-Bazi, former hostage, now a priest at Mar Elia Refugee Camp in Erbil, Iraq, and Professor Robert Destro, Professor of Law and founding Director of the Interdisciplinary Program in Law & Religion at The Catholic University of America’s Columbus School of Law in Washington. 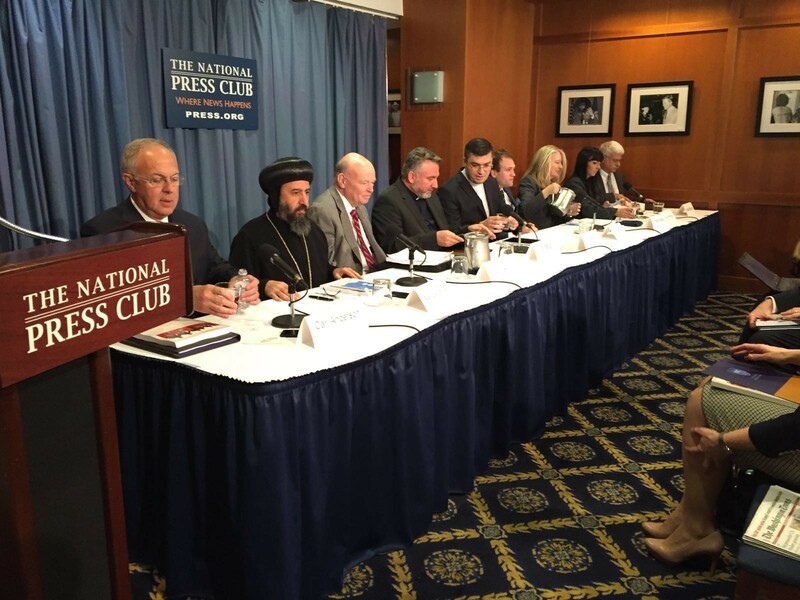 0 Comment(s) to the "Press Release: HG Bishop Angaelos on 'Declaring Genocide', Washington DC"